Membership only requires payment of the yearly dues. In order to fly at the field you will have to have current membership in the Academy of Model Aeronautics (AMA); this affords you liability insurance and other member services from the AMA. You can contact the Academy of Model Aeronautics and sign up on line then print out your receipt. Your receipt will allow you to sign up with us and have full privileges at the field. 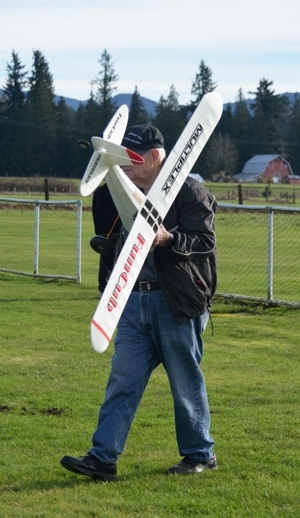 If you're just starting out in the sport of R/C flight, we have club members who are qualified instructors that can help you get in the air quickly and safely. All are welcome. Current club dues are $120.00 annually with a "NEW" member prorate of $10.00 per month including the month of membership application. All returning members are required to pay the regular $120.00 per year dues. Members who renew will be sent a receipt, current year sticker for field access and the gate code, prior to the first meeting in January of the new year. The new gate code will be in effect the first day of the new year. Members who have not renewed by the first meeting of the year will be dropped from the current member roster. Remember to renew your AMA Membership. Those that do not renew thier AMA membership will still be allowed field access but will not be allowed to fly until AMA Membership is brought current. AMA liability insurance is mandatory for use of the field. Sorry, but past members do not qualify for the "guest fly" club rule.